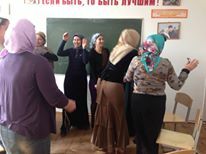 Aishat Zubairaeva conducted a second ‘Power of Goodness’ training with teachers at Secondary School “M.Dadaev” in the Urus Martan region in May. The work of this session was based on the story “Boot Under the Bed”. All the teachers participated actively in the training. 30 copies of the book “Power of Goodness: Stories of Nonviolence and Reconciliation” in Chechen, Russian and English languages were presented to the school. Teachers from the school have already conducted several tutor-group sessions on Power of Goodness with pupils at the school, with the aid of the teacher’s training manual created by CPCD’s team of Little Star psychologists. 33 trainings have been conducted so far this year with 95 teachers in 4 schools and two higher education institutions on using Power of Goodness as a peace and tolerance education tool – at Schools No.s 61. 26 and 56 in Grozny,Goiskoe Middle School “M.Dadaev”, the Chechen State University and Chechen State Pedagogical University.